See Carolyn speak and earn CPD points. We wanted to let you know that Carolyn is doing a number of CPD lectures around Australia in the coming weeks. So if would like to know more about how dental marketing can help you and your practice or if you have read Carolyn’s Book ‘Fully Booked – Dental marketing secrets for a full appointments book’ see below for more information. The course covers a 9-step systematic process in marketing a dental practice that when done correctly, ensure that dental professionals will not only have an understanding of what they could be doing to successfully market their practice but also enable them to plan, track and execute marketing campaigns in an effective manner. Many practices make the mistake of focusing only on gaining new patients. They fail to effectively address the need to retain those they already have. Did you know that the most valuable asset that a practice has is its existing patient base? Every practice wants and needs new patients, but your surest and most predictable source of new revenue is right under your nose. It comes from the loyal patients who already know your practice. Learn and understand how to build on relationships with your existing patients by using effective marketing tools and techniques to turn them into long-term patients. 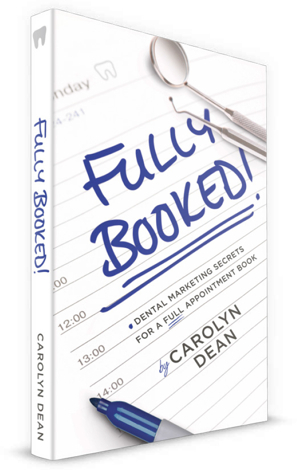 Many of you know that over the last year Carolyn has put blood, sweat and tears into writing her first book ‘Fully Booked – Dental marketing secrets for a full appointments book’. The definitive step-by-step dental marketing book. Helping dental professionals to successfully attract and retain patients.